Robin and Debbie Slade founded Scrubby Oak Fine Foods Ltd in 2005 from their home kitchen with the aim of creating High Quality Preserves in a Victorian style, as they would have been made in our Great Grandparents time – Free from Artificial Additives and Gluten. Drawing upon the wealth of knowledge passed down to them from their Great Grandparents, combining traditional hand made production methods with Whole Natural Ingredients made in small batches. They have created a range of preserves that taste as good as they did before the age of factory mass production. 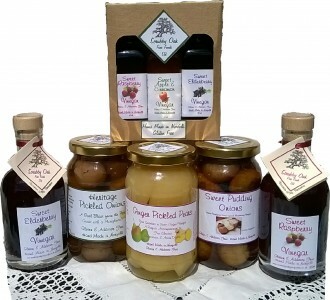 These include such delights as Old fashioned Norfolk Pickled Onions barrel matured for extra bite and flavour, Ginger Pickled Pears a must for your Cheese board, together with a range of twenty-three Sweet English Vinegars, perfect for Marinades and Dressings to name but a few of the traditional preserves we now make. The Scrubby Oak Brand, now in it’s Tenth Year stands for Preserves of Traditional Quality,with exceptional natural flavours.